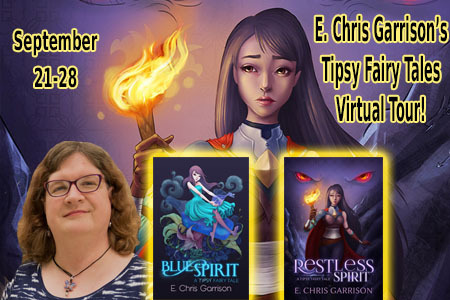 E. Chris Garrison’s Tipsy Fairy Tales Blog Tour featuring the novels Blue Spirit and Restless Spirit! Engaging, fast paced and geeky – these are the words I’d use to describe these books. Skye makes an interesting heroine, not quite what you’d expect, especially since her special powers wake up only when she’s tipsy. It’s not easy to fight evil when you’re drunk :P.
I received both books from the publisher in exchange for honest reviews.